Do you have leftover corned beef from St. Patrick’s Day? Want to use up the last little bit? 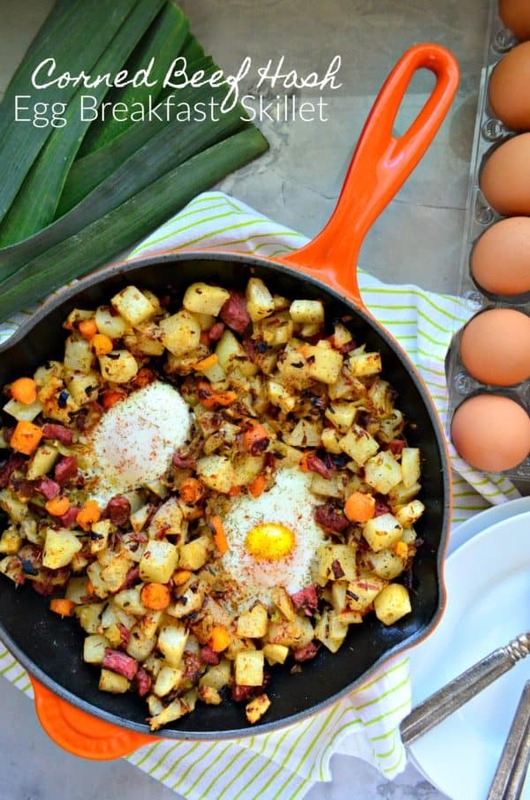 What better way then to make an easy Corned Beef Hash & Egg Breakfast Skillet. 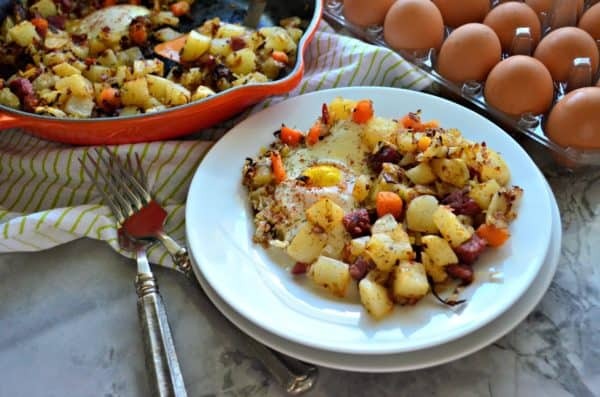 I almost always make corned beef hash with my leftovers and it makes it so easy when I have Simply Potatoes. They are fresh (never frozen) potatoes that come from farm to table to fork. 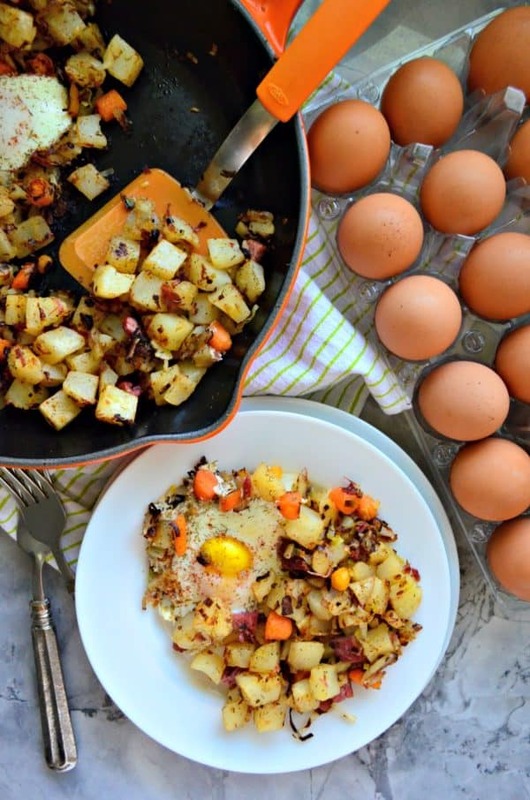 So with just a few ingredients this breakfast skillet is put together in no time! I mean to share this recipe last week–but life got in the way. I’ve been really trying to embrace my days with my little ones. The days are long but the years are short. My son starts school 5 days a week next year, and it’s starting to hit me hard. He only goes to school part time this year so we still have some lazy days to spend together. I say lazy–meaning not rushed to get out the door full of things to do and places to go. I enjoy making breakfast daily for my kids and when my husband is home for him too. I love making breakfast skillets. Always an easy way to get breakfast on the table fast. 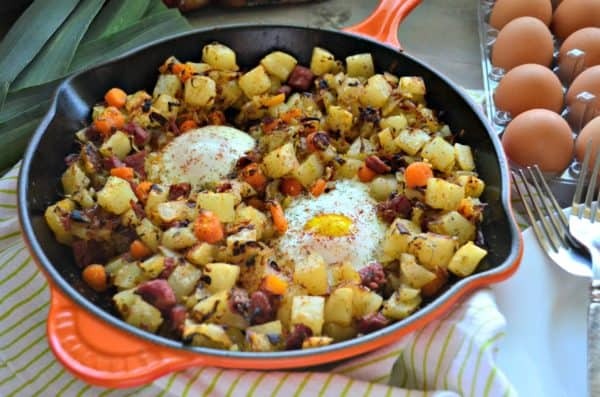 The key to my corned beef hash is using bacon fat. I always keep a jar in my refrigerator and use it to enhance flavors for a meal. When I’m chopping up the corned beef I also chop a few leftover cooked carrots. I’ve always added cooked carrots because I always have a few leftover. After all, minus the corned beef my next favorite part of the meal is the veggies! I only cooked 2 eggs for this skillet since it was just two of us eating it; however, you can crack up to 6 eggs for the hash! Making it ideal for easy entertaining! Melt bacon fat in a cast iron skillet. Then, add in the leaks. Cook on medium-high heat for 3-5 minutes. Add corned beef, carrots, and potatoes. Mix well and cook for 5 minutes. Mix again then add in the dill and smoked paprika. Mix and cook for an additional 5 minutes (mixing every other minute to prevent burning/sticking). Once the broiler is preheated, make two holes in the skillet. Add a teaspoon of oil to each hole then add an egg to each hole. Place cast iron skillet under the broiler for at least one minute or until the eggs are done to your liking. Carefully remove the skillet from the oven. Divided evenly among plates. Enjoy.